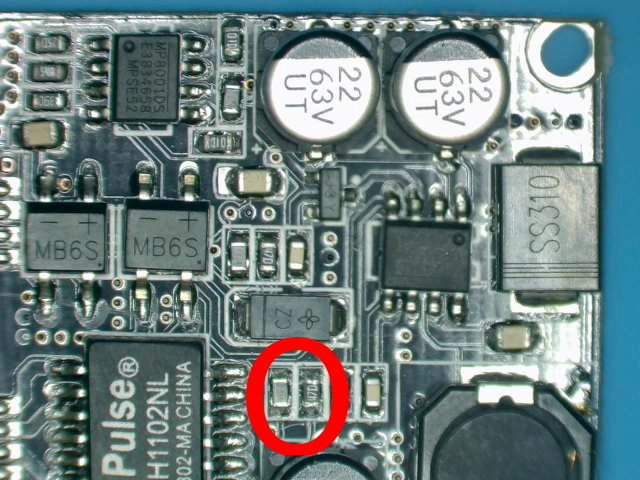 While most projects we see with the ESP32 make use of its considerable wireless capabilities, the chip can be connected to the wired network easily enough should you have the desire to do so. [Steve] liked the idea of putting his ESP32s on the wired network, but found the need for a secondary power connection burdensome. So he took it upon himself to modify some cheap Power Over Ethernet (PoE) hardware and create a single-cable solution (Google Translate). [Steve] bought a PoE module intended for security cameras and ran a close eye over the board to figure out what kind of hardware it was using to generate the nominal 12 V output. He identified an MP2494 step-down converter, and with the datasheet in hand found how the output voltage is configured by changing the values of resistors in the circuit. Swapping out the stock 21.5 kΩ resistor for a 57.1 kΩ one changed the output of the converter to the 5 V necessary for his electronics. But of course that was only half of the problem solved; he still had to connect the Ethernet side of the PoE device to the Waveshare LAN8720 board that’s providing Ethernet for the ESP32. So he removed the RJ45 jack from the LAN8720 completely, and wired that directly to the connector on the PoE board. Helpfully, the PoE board had all the pins labeled on the bottom side so this wasn’t nearly as tricky to figure out as you might expect (if only it was always that easy). We’ve previously covered the Waveshare LAN8720 board for anyone who’s interested in the ins and outs of getting their ESP32 talking Ethernet. If you’re wondering how you can put PoE to work for you, our very own [Jonathan Bennett] has been showing off his home Raspberry Pi infrastructure which makes extensive use of the new PoE hat. Depending on the scope of your requirements, Power over Ethernet (PoE) components can get pretty pricey. 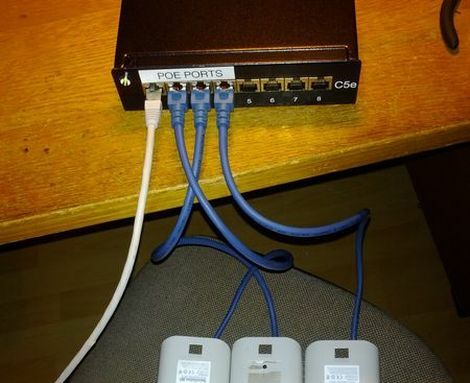 [Fire] wrote in to share a 4-port PoE solution he put together for under 20 euros (Ignore any SSL errors – we’ve checked it out, it’s safe). The most expensive part of the build was the 8-port patch panel he purchased for 11 euros. He popped it open, wiring the first four ports for power after drilling spots for an indicator LED and the PSU. He wound the power lines through ferrite beads to hoping to dampen any interference that might occur before reassembling the panel. In the picture above, you might notice that the panel is being powered via the first Ethernet port rather than through the barrel jack, which [Fire] said was done for testing purposes. When deployed in his network, he plans on using a regulated power supply from a junked laptop to provide electricity. 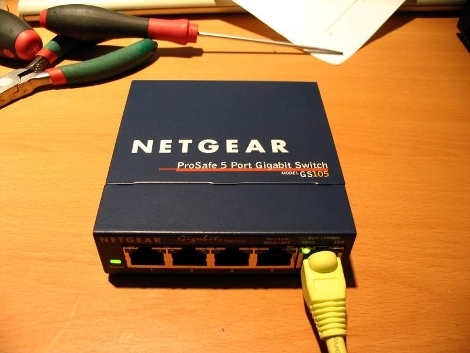 If you need to provide PoE to devices on your network, this is a great way to go about it. Using a patch panel like [Fire] has gives you the flexibility to easily wire up as many powered ports as you need without much hassle. [Scott] wrote in to share a project he is currently working on, a home automation system that relies on Power over Ethernet. While he’s not completely finished, he’s made some great progress, and the work he has done so far definitely piqued our interest. Part of [Scott’s] design relies on some reverse engineered Blackberry screens we showed you a while back. 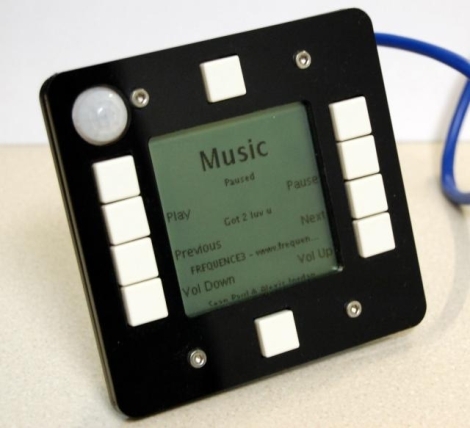 He has constructed a small control panel for his apartment, which incorporates one of the aforementioned Blackberry screens, along with 10 tactile switches and a PIR sensor. The panel is built to be mounted in a wall or as a standalone unit, allowing him to control various lights and appliances throughout his home. [Scott] spent a lot of time working on the communications protocol and UI for his control panel. As it sits now, the panel takes advantage of a VNC-like protocol he designed, which allows him to interact with a Java application residing on his desktop computer. Things are looking awesome so far, and [Scott] already has a handful of improvements planned for the near future. We can’t wait to check it out when it’s finished. [Kajer] was doing some work with IP phones that use Power over Ethernet. While trying to get this to work with a network switch he decided to use PoE to power the switch itself. The best thing about this is he managed to shoehorn all of the necessary bits into the stock case. Those bits include a bridge rectifier, transistor, resistor, and a 5v power supply. Along the way he discovered he can now power the switch off of USB if he wishes.